For other people named Margaret Hamilton, see Margaret Hamilton (disambiguation). Margaret Brainard Hamilton (December 9, 1902 – May 16, 1985) was an American film character actress best known for her portrayal of Miss Almira Gulch and the Wicked Witch of the West in Metro-Goldwyn-Mayer's classic film The Wizard of Oz (1939). A former schoolteacher, she worked as a character actress in films for seven years before she was offered the role that defined her public image. In later years, Hamilton made frequent cameo appearances on television sitcoms and commercials. She also gained recognition for her work as an advocate of causes designed to benefit children and animals, and retained a lifelong commitment to public education. The Wicked Witch of the West was eventually ranked number four in the American Film Institute's 2003 list of the 50 Best Movie Villains of All Time, making her the top-ranking female villain. Hamilton was born to Walter J. Hamilton, and his wife, Mary Jane (née Adams; known by her nickname, Jennie), in Cleveland, Ohio, and was the youngest of four children. She attended Hathaway Brown School, while the school was at 1945 East 93rd Street in Cleveland. Drawn to the theater at an early age, Hamilton made her stage debut in 1923. Hamilton also practiced her craft doing children's theater while she was a Junior League of Cleveland member. She later moved to Painesville, Ohio. Before she turned to acting exclusively, her parents insisted she attend Wheelock College in Boston, which she did, later becoming a kindergarten teacher. Hamilton's career as a film actress was driven by the very qualities that placed her in stark contrast to the stereotypical Hollywood glamour girl. Her image was of a New England spinster, extremely pragmatic and impatient with all manner of "tomfoolery". Hamilton's looks helped to bring steady work as a character actor. She made her screen debut in 1933 in Another Language. She went on to appear in These Three (1936), Saratoga, You Only Live Once, When's Your Birthday?, Nothing Sacred (all 1937), The Adventures of Tom Sawyer (1938), My Little Chickadee (with W. C. Fields, 1940), and The Sin of Harold Diddlebock (with Harold Lloyd, (1947). She strove to work as much as possible to support herself and her son; she never put herself under contract to any one studio and priced her services at $1,000 ($17,400 with inflation) a week. Hamilton costarred opposite Buster Keaton and Richard Cromwell in a 1940s spoof of the long-running local melodrama The Drunkard, titled The Villain Still Pursued Her. Later in the decade, she was in a little-known film noir, titled Bungalow 13 (1948), in which she again costarred opposite Cromwell. Her crisp voice with rapid but clear enunciation was another trademark. She appeared regularly in supporting roles in films until the early 1950s, and sporadically thereafter. 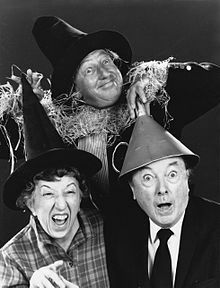 Opposite Bud Abbott and Lou Costello, she played a heavily made-up witch in Comin' Round the Mountain, where her character and Costello go toe-to-toe with voodoo dolls made of each other. She appeared, uncredited, in Joseph L. Mankiewicz's People Will Talk (1951) as Sarah Pickett. In 1960, producer/director William Castle cast Hamilton as a housekeeper in his 13 Ghosts horror film, in which 12-year-old lead Charles Herbert taunts her about being a witch, including one scene in which she is holding a broom in her hand. In 1939, Hamilton played the role of the Wicked Witch of the West, opposite Judy Garland's Dorothy Gale in The Wizard of Oz, creating not only her most famous role, but also one of the screen's most memorable villains. Hamilton was cast after Gale Sondergaard, who was first considered for the role, albeit as a more glamorous witch with a musical scene, declined the role when the decision was made the witch should appear ugly. Hamilton's stand-in and stunt double for the Witch, Betty Danko, also suffered an on-set accident on February 11, 1939. Danko made the fiery entrance to Munchkinland, not Hamilton. She was severely burned during the "Surrender Dorothy!" skywriting sequence at the Emerald City. Danko sat on a smoking pipe configured to look like the Witch's broomstick. The pipe exploded on the third take of the scene. She spent 11 days in the hospital and her legs were permanently scarred. A new stunt double, Aline Goodwin, was hired to finish the broomstick-riding scene for Danko. Almost always they want me to laugh like the Witch. And sometimes when I go to schools, if we're in an auditorium, I'll do it. And there's always a funny reaction, like 'Ye gods, they wish they hadn't asked.' They're scared. They're really scared for a second. Even adolescents. I guess for a minute they get the feeling they got when they watched the picture. They like to hear it but they 'don't' like to hear it. And then they go, 'Ohhhhhhhhhh ... !' The picture made a terrible impression of some kind on them, sometimes a ghastly impression, but most of them got over it, I guess ... because when I talk like the Witch, and when I laugh, there is a hesitation and then they clap. They're clapping at hearing the sound again. Hamilton played two credited roles in the famous film: Almira Gulch and the Wicked Witch of the West. Hamilton also appears as an unidentified flying witch during the tornado scene. Some[who?] argue this is actually intended to be the Wicked Witch of the East rather than her sister, and Hamilton's credited role, the Wicked Witch of the West; if so, this would be a third, uncredited role. Only co-star Frank Morgan played more roles in the film (five roles). Hamilton and Morgan never share any scenes in Oz. However, in By Your Leave (1934), she plays his housekeeper, and in Saratoga (1937), she has a colloquy with Morgan regarding a cosmetic product he invented (with side glances and eye rolls by Morgan as to its effect on her "beauty"). Hamilton's line from The Wizard of Oz — "I'll get you, my pretty, and your little dog, too!" — was ranked 99th in the 2005 American Film Institute survey of the most memorable movie quotes. Her son, interviewed for the 2005 DVD edition of the film, commented that Hamilton enjoyed the line so much, she sometimes used it in her real life. A few months after filming Oz, she appeared in Babes in Arms (1939) as Jeff Steele's mother, Martha, a society do-gooder who made it her goal to send the gang of child actors, led by Mickey Rooney and Judy Garland, to a work farm. In 1945, she played the domineering sister of Oz co-star Jack Haley in George White's Scandals, comically trying to prevent him from marrying actress Joan Davis, even going so far as to throw a hatchet at her. Hamilton and Ray Bolger were cast members in the 1966 fantasy film The Daydreamer, a collection of stories by Hans Christian Andersen. A few years later, they were reunited on Broadway for the short-lived musical Come Summer. In 1962, Hamilton played Leora Scofield, a suffragette who arrives in Laramie, Wyoming, to bolster feminist causes in a territory where women had already obtained the right to vote, in the episode "Beyond Justice" of NBC's Laramie. In the story line, she is depicted as a long-lost friend of series character Daisy Cooper, played by Spring Byington. Series lead character Slim Sherman (John Smith) is skeptical of the suffragettes, and Sheriff Mort Corey and he concoct a tale the women should head to Cheyenne, where their services are more needed than in Laramie. Having started on the stage in the early 1930s, she began to work extensively in the theater after leaving Los Angeles, and appeared on Broadway in the musical Goldilocks opposite Don Ameche and Elaine Stritch, gave a lighter touch to the domineering Parthy Anne Hawks in the 1966 revival of Show Boat (dancing with David Wayne), and was the tender Aunt Eller in the 1968 Lincoln Center revival of Oklahoma!. Hamilton also toured in many plays and musicals, even repeating her role of the Wicked Witch in specially written stage productions of The Wizard of Oz. For her last stage role, she was cast as Madame Armfeldt in the Stephen Sondheim musical A Little Night Music, singing the song "Liaisons" for the national tour costarring with Jean Simmons as her daughter Desiree. Even with her extensive film career, Hamilton took roles in whatever medium she could get if she was free, making her soap-opera debut as the nasty Mrs. Sayre on Valiant Lady, who schemed to prevent her daughter from marrying the heroine's son. In the 1960s, Hamilton was a regular on another CBS soap opera, The Secret Storm, playing the role of Grace Tyrell's housekeeper, Katie. In the early 1970s, she joined the cast of another CBS soap opera, As the World Turns, on which she played Miss Peterson, Simon Gilbey's assistant. She had a small role in the made-for-television film The Night Strangler (1973), and appeared as a befuddled neighbor on Sigmund and the Sea Monsters, who is a friend of the very similar Mary Wickes. In The Paul Lynde Halloween Special (1976), she portrayed Lynde's housekeeper, reprising the Wicked Witch role, as well as introducing Lynde to the rock group Kiss. 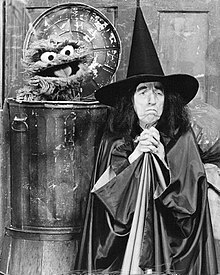 She reprised her role as the Wicked Witch in an episode of Sesame Street, but as a result of complaints from parents of terrified children, the episode has not been seen since 1976. She appeared as herself in three episodes of Mister Rogers' Neighborhood, between 1975 and 1976, because Fred Rogers wanted his viewers to recognize the Wicked Witch was just a character and not something to be afraid of. 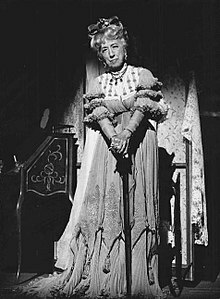 Hamilton continued acting regularly until 1982, her last roles were two guest appearances as veteran journalist Thea Taft (in 1979 and 1982) on Lou Grant. Throughout the 1970s, Hamilton lived in New York City's Gramercy Park neighborhood and appeared on local (and some national) public-service announcements for organizations promoting the welfare of pets. Her most visible appearances during this period were as general store owner Cora, in a national series of television commercials for Maxwell House coffee. On October 30, 1975 she guest-starred on the radio revival series CBS Radio Mystery Theater. In the episode, entitled "Triptych For A Witch," Hamilton played the title role. Hamilton remained a lifelong friend of The Wizard of Oz castmate Ray Bolger. She married Paul Boynton Meserve on June 13, 1931, and made her debut on the New York City stage the following year. While her acting career developed, her marriage began to fail; the couple divorced in 1938. They had one son, Hamilton Wadsworth Meserve (born 1936), whom she raised on her own. She had three grandchildren, Christopher, Scott, and Margaret. Hamilton never remarried. Bruce Vilanch, who worked with her in her dotage, stated she was discreetly lesbian. Hamilton's early experience as a teacher fueled a lifelong interest in educational issues. She served on the Beverly Hills Board of Education from 1948 to 1951, and was a Sunday school teacher during the 1950s. She lived in Manhattan for most of her adult life. In 1979, she was a guest speaker at a University of Connecticut children's literature class. She later moved to Millbrook, New York. She subsequently developed Alzheimer's disease, and died in her sleep following a heart attack on May 16, 1985, in Salisbury, Connecticut. She was 82 years old. Her body was cremated at Poughkeepsie Rural Cemetery, and her ashes were scattered at Amenia, New York. 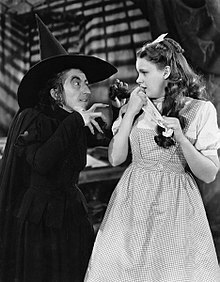 ^ a b "Margaret Hamilton, 82, Dies; Played Wicked Witch In 'Oz'". New York Times. May 17, 1985. Retrieved 2007-07-21. Margaret Hamilton, the actress whose role as the cackling Wicked Witch of the West in The Wizard of Oz unnerved generations of children, died yesterday, apparently of a heart attack, at a nursing home in Salisbury, Connecticut. She was 82 years old. Miss Hamilton was a gentle, lively woman who taught kindergarten for years before she began a career of 50 years in the theater, movies, radio and television. But she seared a fearsome image on the public consciousness in 1939 when, at the age of 36, she played the Wicked Witch, the terror of Judy Garland's long dream in the classic film of L. Frank Baum's story. ^ Harmetz, A. (1998). The Making of The Wizard of Oz: Movie Magic and Studio Power in the Prime of MGM. New York: Hyperion Books. ^ "Beyond Justice: Laramie (TV series), November 27, 1962". IMDb. Retrieved November 19, 2012. ^ Potempa, Philip (October 27, 2017). "Wicked Witch of the West not always a fright sight". Post-Tribune. Crown Point, IN: Chicago Tribune Media Group. Retrieved March 28, 2018. ^ Margaret Hamilton profile, FilmReference.com; retrieved March 17, 2013. ^ Juran, Robert A. (1995). Old Familiar Faces: The Great Character Actors and Actresses of Hollywood's Golden Era. Movie Memories Publishing. p. 109. ^ "Television: April 4, 1960". Time. Time Inc. Orig. (Marc & Lynne Benioff Present). April 4, 1960. Retrieved February 3, 2019. Dow Hour of Great Mysteries (NBC, 9-10 p.m.). The first of a series of classic mysteries adapted for TV. Mary Roberts Rinehart's The Bat stars Helen Hayes and Jason Robards Jr. Host: Joseph Welch. Wikimedia Commons has media related to Margaret Hamilton.